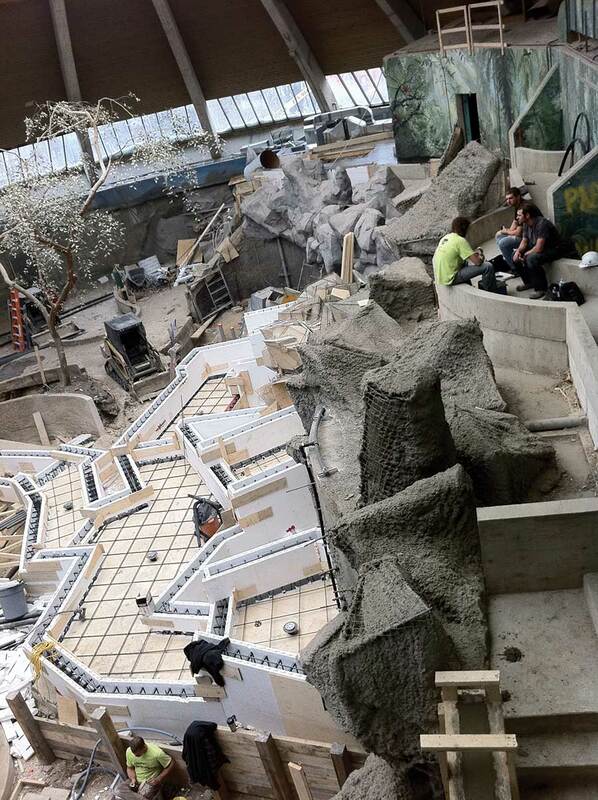 ICFs were used to create the organic shapes and water features of the Winnipeg Zoo’s new jungle-themed exhibit. While the vast majority of ICFs are used to construct buildings, a small but growing niche for ICFs is their use in civil engineering applications. These projects can be extremely profitable for the ICF contractor while still providing a bid that is far more cost effective than other options. On the following pages, we showcase four different projects stretching from the Caribbean to Northern Canada—all completed within the past two years—that demonstrate a few of the possibilities. Additional pictures and video for all these projects are available on the magazine website www.icfmag.com. 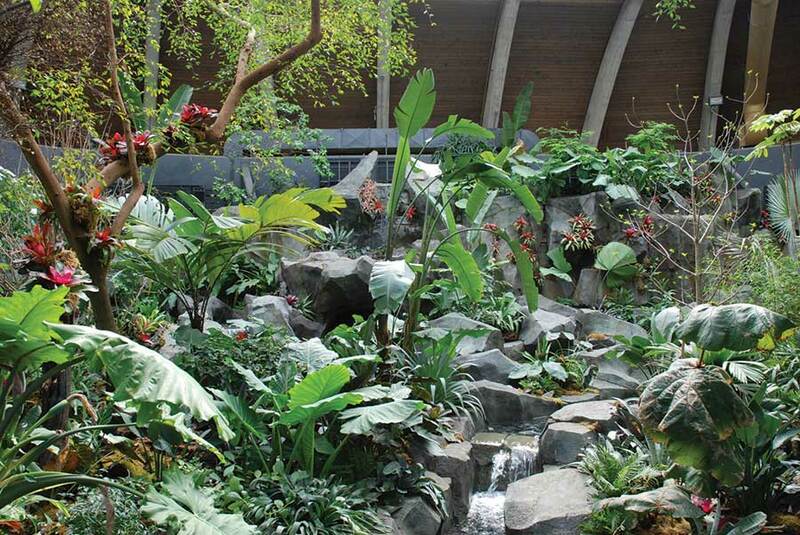 One extraordinary “civil engineering” application is the Tropical House at the Winnipeg Zoo. 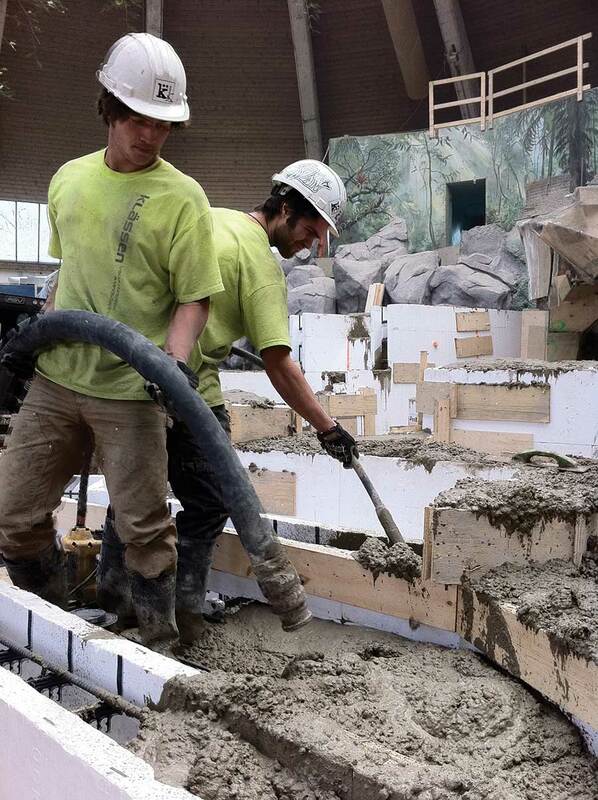 When the zoo originally contacted Klassen Concrete, a local concrete construction company, they were looking for a bid to demolish an aging building which had fallen into disrepair. The space would be replaced with “Toucan Ridge,” an exhibit with a rocky, jungle-type environment to showcase the animals, birds and plants native to South and Central America’s rain forests. Owner Randall Klassen proposed he could do not only the demolition but also the complex decorative portion of the job as well. 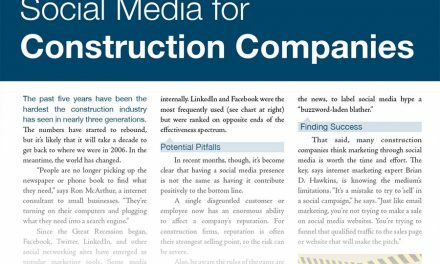 Impressed with his competitive prices, innovative approach, and ability to complete other similar projects, the owners awarded him the work in September of 2010. For inspiration, Klassen and his wife went to Costa Rica, where they took hundreds of pictures of waterfalls, rock formations, and other natural features. 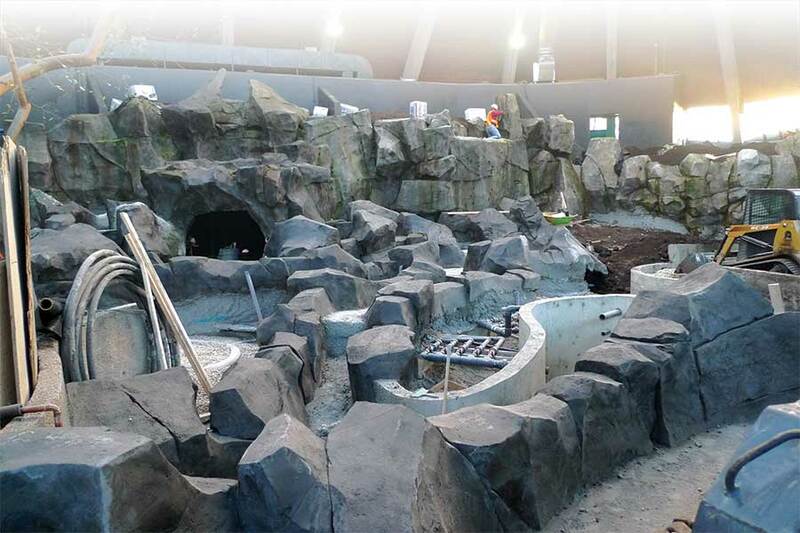 These photos guided him as he laid out the exhibit, which covers several thousand square feet and includes faux cliffs, boulders and no less than eleven waterfalls. The vertical surfaces were built up using Fox Blocks ICFs, which Concrete Décor magazine calls “one of the most innovative methods they used.” (Klassen is a cousin of Fox Blocks’ technical director Glen Klassen.) Even Randy Klassen was surprised at how easy ICFs were to work with. “They surprised us with their versatility,” he says. Square corners are rare in nature and non-existent in Klassen’s design. All 49 corners are hand cut, set on six different slab levels. Basically, the crew set the plywood floor forms in place, then stacked the ICF walls on top of them. Wall heights vary from two to six feet. They cut holes at regular intervals in the lowest course of forms so the concrete would flow freely across the open floor space before filling the ICF wall cavity. Klassen says this method created a monolithic, watertight system and gave them better control of the pour. It was also far simpler than using plywood. “Using the ICFs saved us two weeks of work,” he says. The ICF portion of the project used 140 forms and 26 yards of concrete. 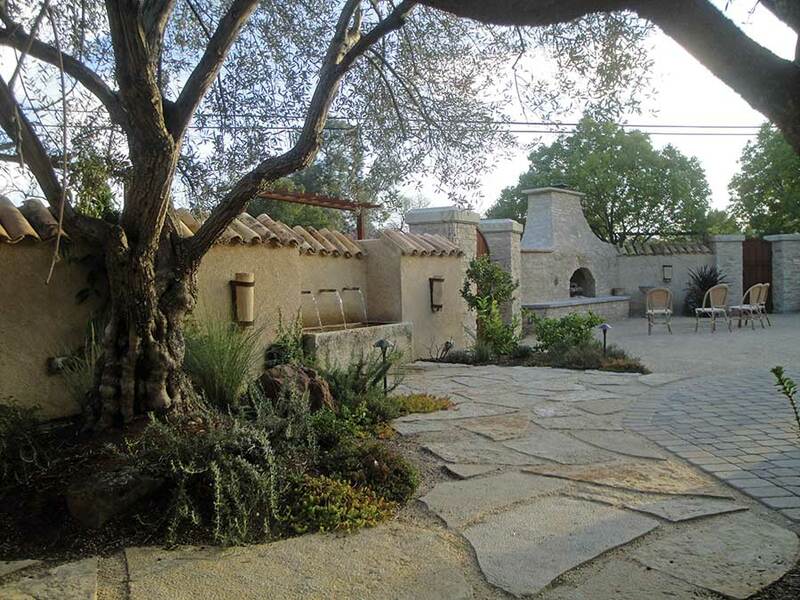 Once the walls were set, they were sprayed with a thick layer of shotcrete and topped with a specialized “carve coat” to perfectly match natural stone. ICF scraps were used to create freestanding boulders and add texture to the walls. It took Klassen and his crew of 12 almost four months and 1,500 bags of carve coat to construct the massive rockscapes of Toucan Ridge. A few additional weeks were needed to stain the rocks, add moss and other effects. Owners were blown away with the realism that ICFs helped achieve. “It’s impossible to describe how impressive and unbelievably beautiful the new space is,” says Margaret Redmond, president and CEO of the conservancy. Fox Blocks is enthusiastic about the opportunities this niche presents as well. Shortly after the zoo was completed, the company shipped forms to build a pair of 100’ x 35’ tanks for a fish farm in Tennessee. Only 1.5 blocks tall, the tanks still represent approximately 800 units. 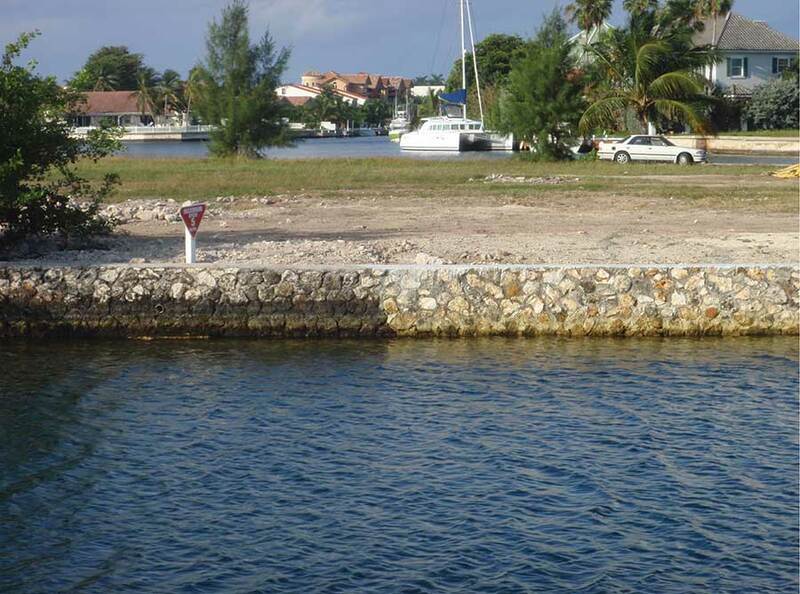 Sam Small, a professional engineer and Quad-Lock distributor based in the Cayman Islands, was asked to prepare a bid to repair and/or replace 260 linear feet of seawall in an exclusive gated community on the island. About a third of the wall, built of unreinforced cobblestone masonry, had already collapsed. 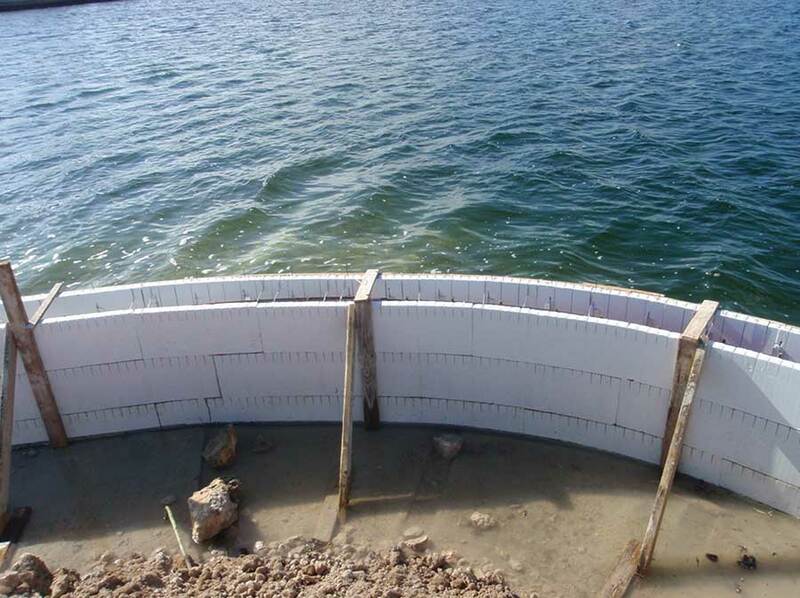 Free-form curves were easy to build with ICFs, and conformed to the original wall location to within a half-inch. Small bid the restoration using the original masonry method and with ICF. The bid was much lower for the ICF version, and when Small included a warranty on the wall against future storm damage, the owner was sold. The original wall’s footprint was not straight but free-form curves following the sea boundary, and the owner—who understandably wanted to preserve his prime real estate—insisted that they follow that line exactly. 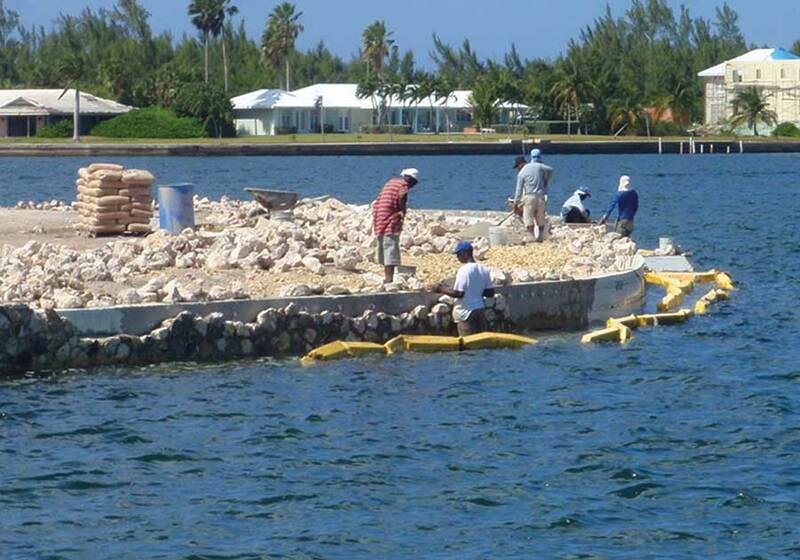 The first step was to remove the remaining 176 linear feet of failing wall and carefully save the facing stone so that it could be recycled and used as facing in the new ICF seawall. Pouring curved footings underwater presented a challenge. 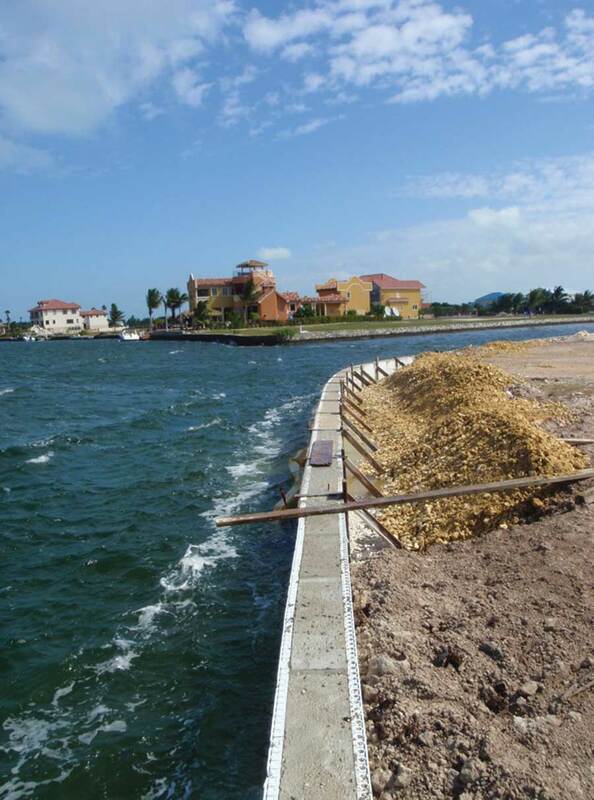 The team chose to use the Fast Foot Foundation System as the wave action would not damage the fabric footing form. After a few seasons of weathering, the new section wall (at right) will be virtually indistinguishable from the original. Once the storm passed, the pace of work accelerated. Skilled masons faced the wall with the original salvaged stone—often standing knee-deep in water. The three-inch cut stone façade was secured using tieKey, a specialty masonry/ICF tie available through Wind-Lock. Even with the storm delays, the project was completed on time, and on budget, and avoided wasting hundreds of square feet of plywood. The client was so impressed with the ICF system, Small’s company is currently designing and building his 22,000 sq.ft. residence on the property. 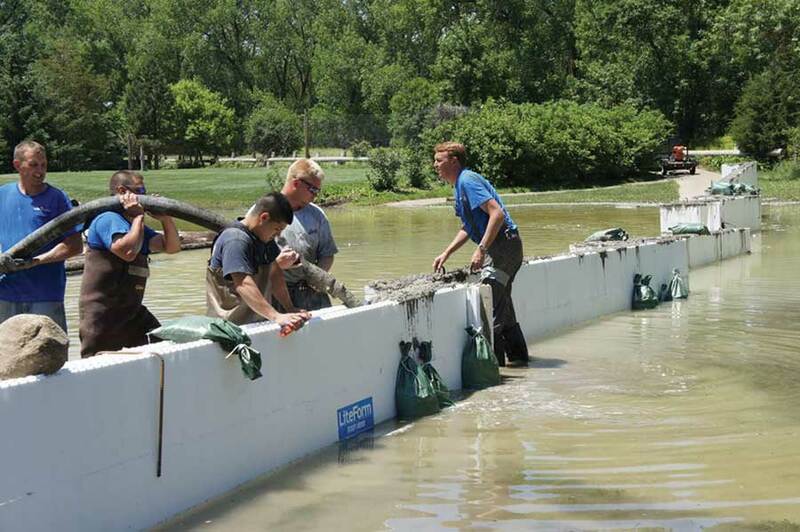 When the Missouri River overtopped its bank this spring, hundreds of towns were in danger of severe flooding, including South Sioux City, Nebraska, headquarters of Lite-Form Technologies. Pat Boeshart, president of the company, felt the earthen levee (built in 1952) might be inadequate, so he approached the city about using ICFs to create a secondary line of defense. ICF floodwalls proved easy to build, easy to fill, and easy to remove after the emergency had passed. Cities in the region are considering using ICFs as part of a permanent flood protection system. Soon a vacant Wal-Mart near the river was humming with volunteers. They assembled the ICFs into wall segments 24 feet long by 4 foot tall, with a short jog at the end of each segment to provided stability and protection from debris. They assembled, delivered, and set a full half-mile ( 9,600 sq. ft) of the new Z-Wall in less than 5 hours. Filled with 250 yards (1,000,000 lbs.) 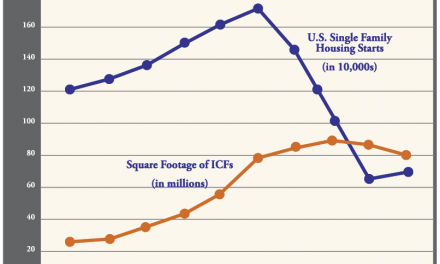 of concrete, the ICF floodwalls protected the most vulnerable area of the city. A local golf course owner, seeing the walls success, requested a few hundred yards of Z-walls to reclaim the 13th hole from the river. David Hall, marketing manager for the company, says the segments were floated out to the golf cart path, weighted down with sandbags, and then filled with concrete. A single night’s worth of pumping left the fairway soggy, but playable. 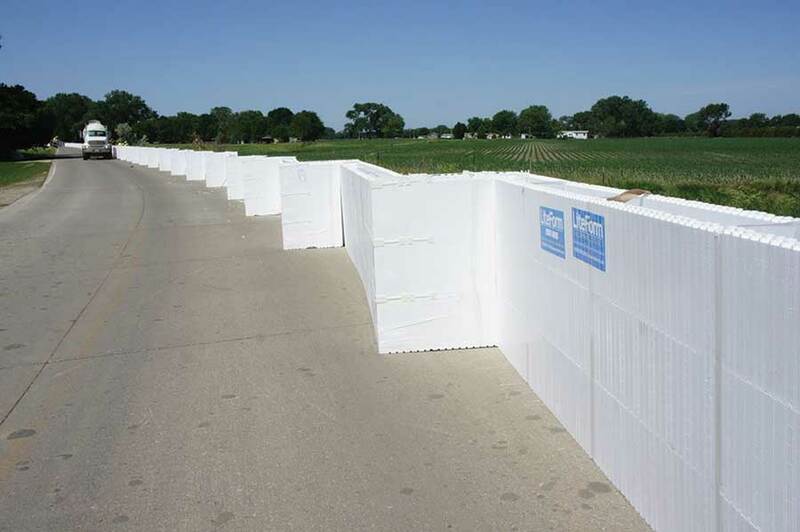 “These temporary ICF flood walls are lighter, faster, and better than traditional sandbag berms,” says Hall. 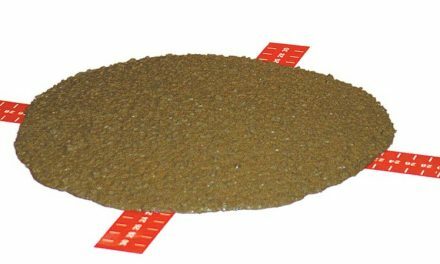 “We learned that temporary fill such as sand or gravel doesn’t work, but filled with concrete, they’re extremely effective and can even be moved as the need arises. The company ended up donating tens of thousands of forms to the effort. 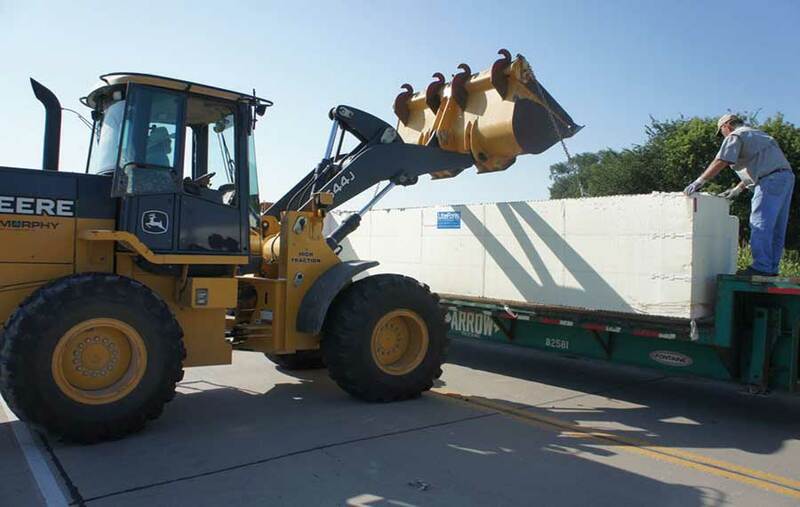 When the threat of floods was passed, the Z-Wall segments were picked up by city crews using a front-end loader. They’re being stored in a warehouse for use in future high-water events. In 2008, Darius and Sarah Anderson bought Ramekins, a culinary art school in the heart of California’s wine country. The building is set well back from the street, and the new owners realized they could transform the unused strip of land into a secluded courtyard for weddings and special events. One important component of the design was the eight-foot tall garden walls, built from IntegraSpec ICF. The foam forms reduced noise infiltration from the street, provided a perfect substrate for the stucco-and-stone finish, and offered an unprecedented degree of design flexibility. 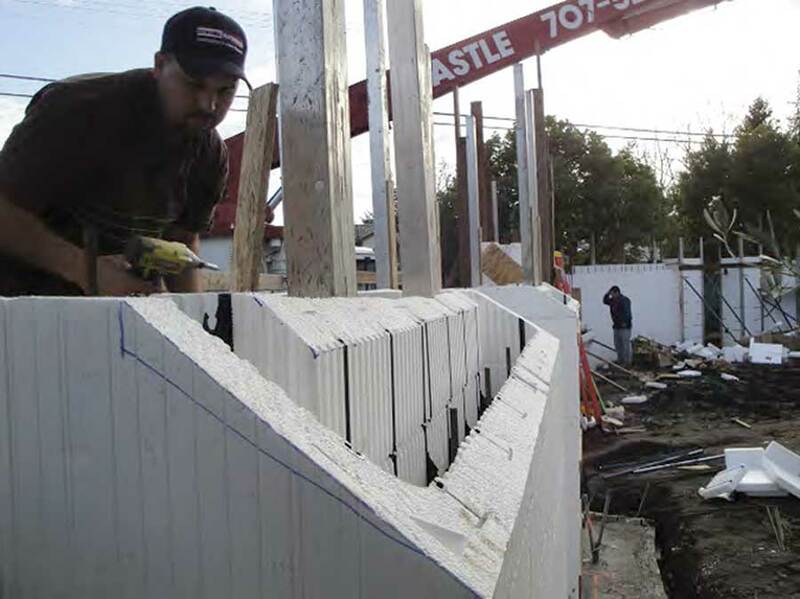 ICFs were used for everything from the footings to the custom-cut 45-degree wall top. Pilasters, fountains, even a built-in fireplace and pizza oven were made from ICFs. Erik Garcia and his crew from Sonoma Materials did the ICF install and all the finish work. He roughed out the fireplace shell by varying the core width of the ICF as the wall went up. Then, he had the landscape architect and conceptual artist take a marker and draw the final shaping details directly on the foam. From there, it was a simple matter to cut the outline to the finished shape. The fountain was simpler, since it featured square corners. The dozens of jogs in the wall were easily accommodated by the panel ICF system with minimal waste, and the results are amazing. The owners were so pleased with the progress that they booked a wedding to take place shortly after the April completion date, eliminating all wiggle room in the already fast-tracked schedule. Used for everything from the footing (above left) to the slanted tile roof (above right), foam forms were even used to form the fountain, fireplace, and pizza oven. 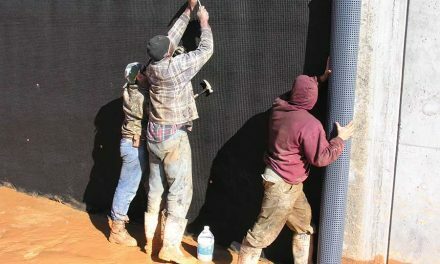 Garcia calls it “a nice easy application” despite the groundbreaking nature of the job and the often inclement weather. 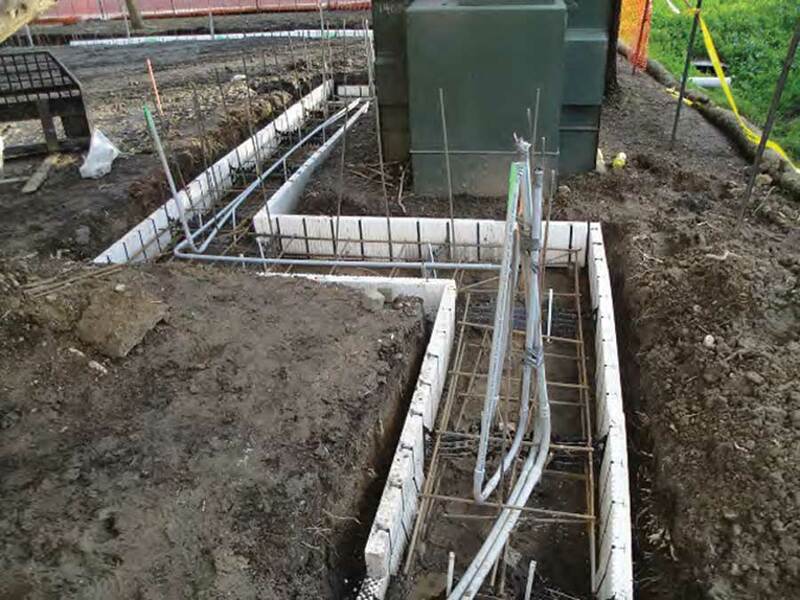 “This project has definitely opened up new possibilities for the use of ICF,” says Nikiforuk.